My mother use to love to make baked ziti. It was her go-to dish on Wednesdays when she had to hurry to choir rehearsal but still wanted us to have a hot, homemade dinner. She’d whip up her famous baked ziti, twist some canned biscuit dough and brush them with basil parmesan butter to make them look like mini breadsticks and throw together a simple green salad. I could always tell when it was “baked ziti day” in the house. That fragrant aroma of fresh basil, onions and garlic traveled all throughout the house and even outside where we were playing. Seeing that bubbling cheese cook away in the oven was pure torture and we NEVER let it cool off before digging in. 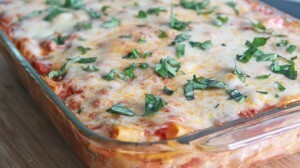 It’s a meal I will never forget and I have YET to find another baked ziti recipe that is as good as this one. It’s just the perfect blend of…. EVERYTHING! Maybe I’m biased because it’s the way mom made it : ) I remember everybody asking for this recipe growing up. It was right up there with my grandmother’s yeast rolls. Even though my mother has passed, every now and then I’ll run into a childhood friend and they will remind me of what an amazing baked ziti my mom use to make. That’s when you know you have a special dish! Strangely enough I probably only make baked ziti once a year. Not sure why, probably because there is just no way I can make it as special as she did. 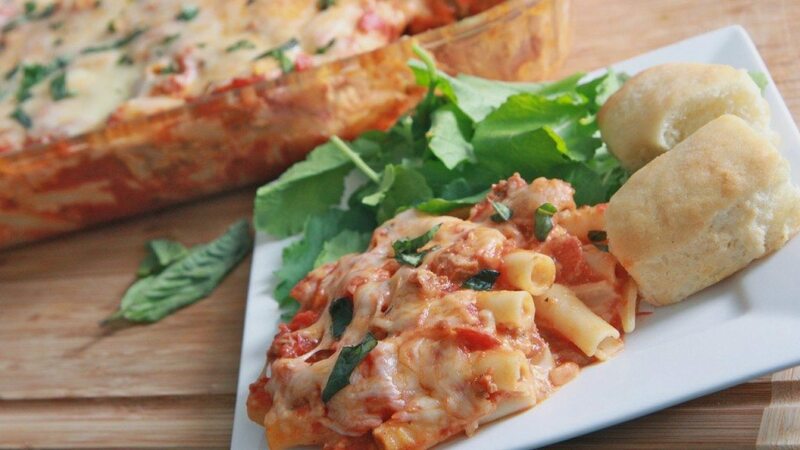 I feel blessed to be able to share this recipe with you guys and relive some great childhood memories of eating this delicious baked ziti almost every Wednesday. 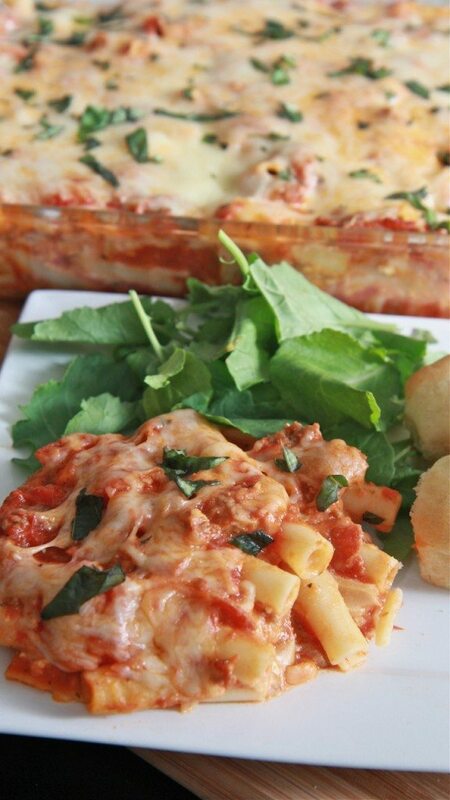 Watch me make Mom’s Easy Baked Ziti recipe from start to finish! Prepare the ziti according to package, except cook it a little under al dente. Rinse with cold water to cool noodles, drain and set aside. In large bowl stir together beaten egg, ricotta cheese, cottage cheese, 1-2 tablespoons fresh basil and 1½ cups of Italian blend cheese. In a 9x13 casserole dish spread out a thin layer of meat sauce. Sprinkle with the mixed cheddar cheeses and then lay on the slices of smoked gouda. Bake for 25-30 minutes or until cheese is melted and bubbly! Garnish with lots of chopped fresh basil. 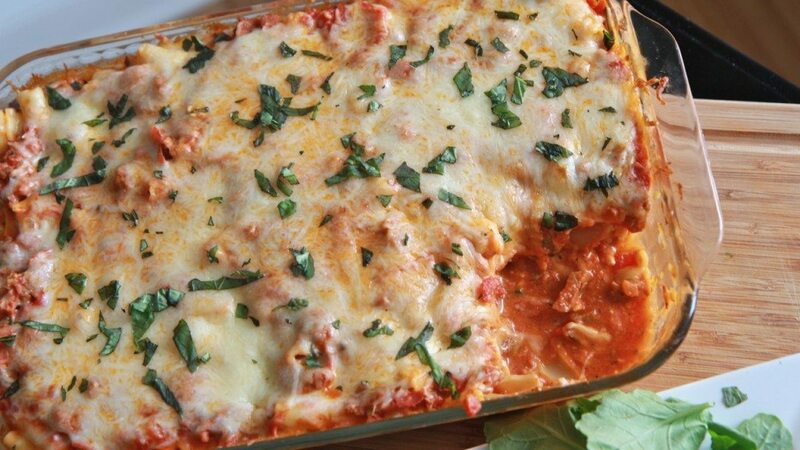 Let baked ziti sit before serving. Can’t wait to make this this week! Your recipes never disappoint. Thank you for sharing them!!!!! I’ve made this several times and EVERYONE LOVES IT. GIRL YOU’RE THE BEST. This baked ziti recipe sounds great. I think I will give it a try. Love this recipe, I have made it several times for me family adding a few of my own touches due to my family’s likes and dislikes. Must say I prefer it as is but either way it’s the best ziti dish I have come across to date. Thank you and your mom for such a wonderful dish. Listen up folks! I am Italian and brought up by three Italian aunts , one of whom , was the best cook you could ever imagine. I long for her stuffed artichokes every day of my life! This ziti recipe is over the top —I mean over the top!!! Gouda cheese? Hey, it works. Be prepared to loosen those belts because this will have you coming back for much more. Way to go Diva —-your Mom must have been an awesome cook , like my Aunt Jessie. I love your recipes. Thank you, for showing me new things to try. My family has been loving the new meals. I bought most of the products, but I have some left over I don’t know what to make with it. Can you make a week recipe with only ingredients we buy for a week. I think that would great! Love ya! 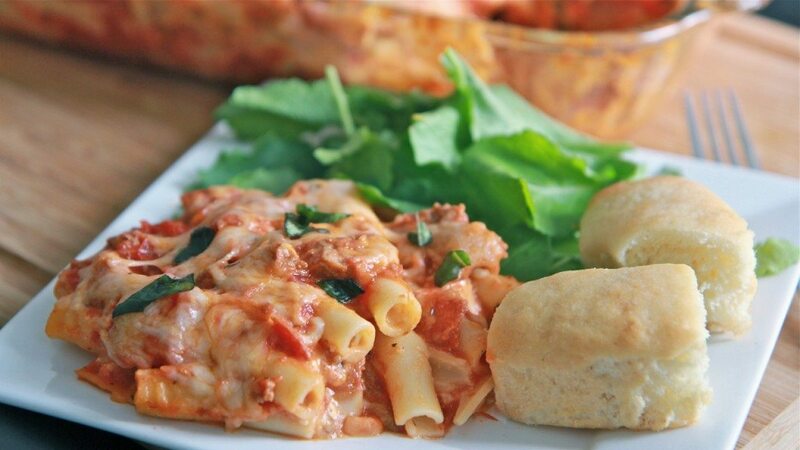 “Mom’s Baked Ziti” is now “My Baked Ziti” the flavor is unbelievably tasty. you are right girl “Don’t forget the Gouda! I share the recipe all the time.